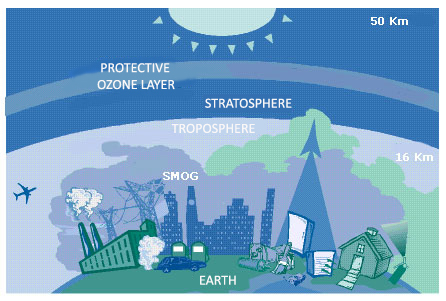 The ozone layer extends above the stratosphere and protects life on Earth from the sun’s harmful ultraviolet (UV) rays. This natural shield has been gradually depleted by man-made chemicals like chlorofluorocarbons (CFCs), usually used for and . The Montreal Protocol signed in 1987 banned the use of these substances with positive results. Projections indicate that the ozone layer should return to 1980 level between 2050 and 2070.